This article presents some practical ESL activity and game ideas for teaching beginners how to ask basic questions about time. Feel free to use these ideas as a stand-alone ESL lesson plan, or to supplement an existing one on a similar or related grammar topic. 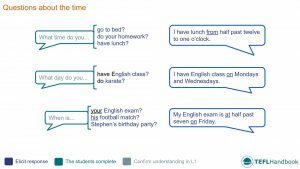 The board below is one example of how to introduce different present simple question constructions about time and routine. Step through each type of question, write the beginning part and elicit different endings and sample answers from your students. If you're an iOS or Android user, try this lesson out on the TEFL Handbook app. It gives you offline access to all of our materials, perfect for quick reference in the classroom. The students help you to create your daily schedule on the board before making their timetable for their day. Try to elicit as much as possible for the first part of this activity. With your students' help, you will create your daily schedule on the board. Start by drawing a table with the column headings task and time. Next, elicit some everyday activities from the students, along with a duration and complete the table with these ideas. After they have helped you finish your timetable, tell the students to create their schedule for today. For this writing activity, the students will create statements that express duration. Start by teaching that we can express duration using the below construction. Then, using your timetable from the previous exercise, add an example sentence to the board. If you can, elicit a translation in L1. I have breakfast from half-past seven to eight o'clock. 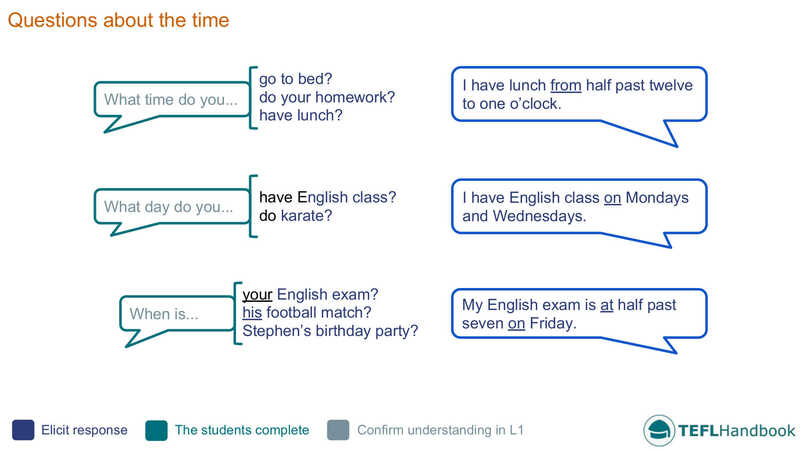 Finally, tell the students to write three sentences about their daily routine using this structure. Following on from the previous activities, students will now work in groups to interview each other using their timetables. Divide the class into groups of 3-4 and have them use their notebooks to ask each other questions about their day. You should demo this with another student before they begin. Student A: What time do you go to school? Student B: I go to school at half-past eight. A pair-work activity where students ask each other questions using the information from a table on the whiteboard. To begin, draw a table on the board with the headings activity, day, and time. Then add the events below and randomly fill in the days and times. Add durations if you feel the class is comfortable with the topic. In pairs, students will take turns asking each other questions using the information from the table. Before they begin, you should demo this with another student. Teacher: When is the Justin Bieber concert? Student: It's on Saturday at six o'clock. Players have to mime different activities to their teammates. Start by dividing the class into pairs. On each turn, one student will sit with their back to the board, facing their teammate. You'll write a typical routine activity on the board that the student in play must mime to their partner in the hot seat. To make this interesting, the student in the hot seat must first say the activity, then make a factually correct statement about their partner using that activity and a time expression. Set a time limit if you wish. Players win 1 point for guessing the correct activity and a bonus point for guessing the correct time that their partner does this. Use the work from the earlier exercises to confirm if the times are right. We hope that you've found a few of these ideas useful. Our suggested next lesson is on prepositions of place. Be sure to check out our complete list of ESL lesson plans for beginners (A1 Upper), as well as our entire collection of ESL lesson plans. Also, if you are an iOS or Android user, this lesson plan is available for free on the TEFL Handbook app. An ESL lesson planner for English teachers.